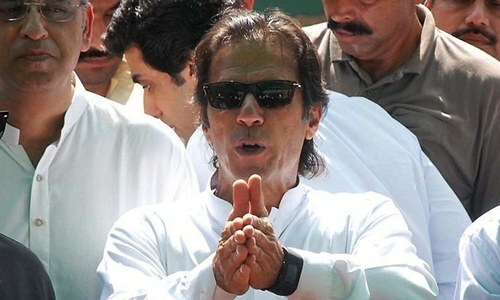 Pakistan Tehreek-i-Insaf (PTI) chief Imran Khan married Bushra Maneka, a respected Pir [faith healer] in Pakpattan, in "a simple ceremony" in Lahore on Sunday, the party's spokesperson told DawnNews. Confirming Khan's third marriage, PTI spokesperson Fawad Chaudhary said that the ceremony was held at the residence of Bushra's brother. 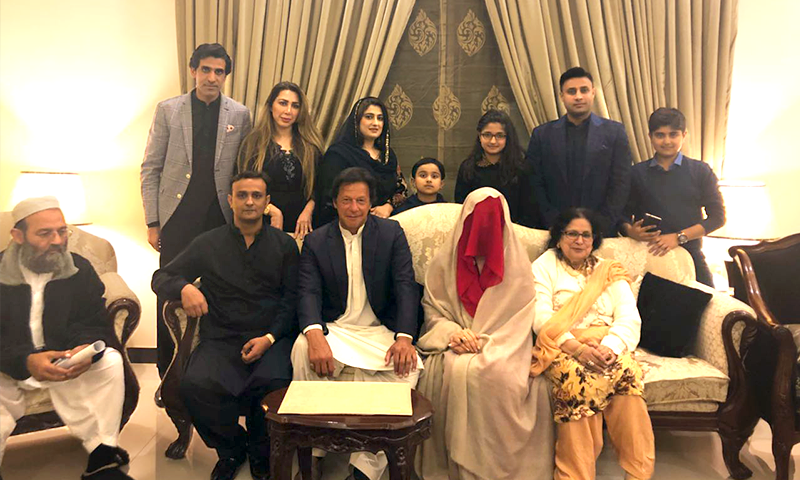 Party leader Inamul Haq told DawnNews that only close relatives, including the bride's mother, and friends participated in the ceremony — Khan's sisters, however, were not in attendance. Mufti Saeed performed the nikah in the presence of Awn Chaudhary and Zulfi Bukhari who appeared as witnesses, said PTI members. The ceremony was a low-profile one as per the desire of Imran Khan, Haq added. He expressed hope that Imran Khan's marriage would prove blessed not only for him and his wife but for the entire nation. PTI leaders, including Naeemul Haque, Shireen Mazari, Jahangir Tareen, and Shah Mehmood Qureshi, congratulated Khan and his new wife on their marriage on Twitter. Bushra Maneka is in her 40s, and belongs to the Wattoo clan, of which the Manekas are a sub-clan. 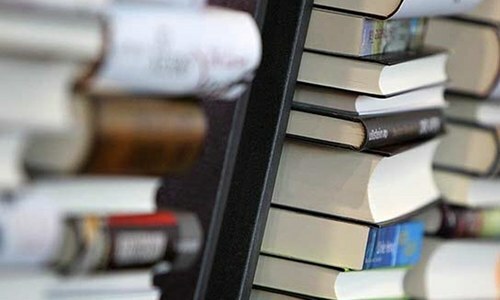 Earlier, she was married to Khawar Farid Maneka, a senior customs official in Islamabad but parted ways in recent times. The PTI chief has been married twice before. His first marriage was with Jemima Goldsmith, daughter of a British billionaire in 1995. The couple divorced in 2004. Khan's second marriage to Reham Khan dissolved 10 months after a public ceremony had taken place in January, 2015. 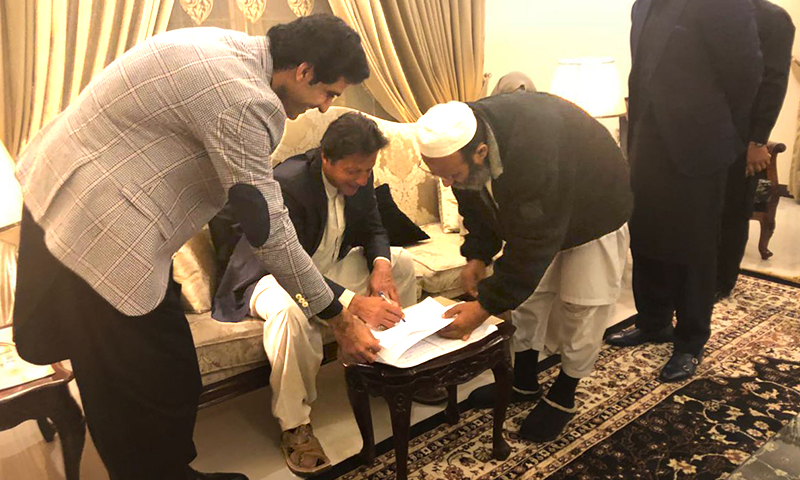 The News in an article published in January claimed that Khan had married for the third time in a secret ceremony on January 1, saying that Mufti Saeed had performed the nikkah. PTI had originally refuted the claim, calling the speculation "ridiculous". 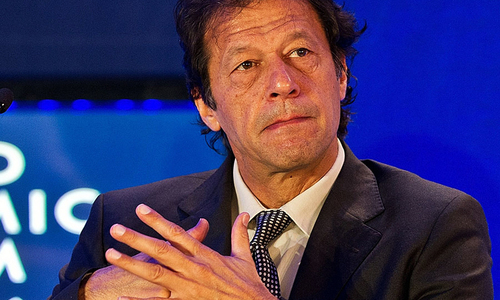 A day later, however, the party had 'clarified' that Khan had only proposed marriage to Bushra Maneka. Read: What brings PTI chief to a remote town? Soon after, the party leader had also broken his silence on the speculation through a series of tweets, saying, "My only crime is wanting to get married". Khan, who has two sons from his first marriage, had also appealed to people to pray for his "personal happiness". He had made it clear that he only sent the proposal for marriage after she divorced her husband. Khan’s connection with the Manekas was confirmed by PTI leader Naeemul Haq in 2016 when rumours were doing the rounds that the PTI chief had married a UK-based relative of the family on the advice of his spiritual patron, Bushra Bibi, also known as Ms Pinki Pir. Haq had then denied reports about Khan’s third marriage but confirmed in his tweet that his leader had “spiritual relationship” with the Maneka family. A source close to the family had told Dawn that Khan first visited Bushra ahead of the NA-154 (Lodhran) by-poll in 2015 and was very pleased when Jahangir Tareen won the seat according to her prediction. Since then he has been visiting her regularly, the source had added. Mumtaz Hayat Maneka, a young Aitchisonian from the Maneka clan, had said the PTI leader had a lot of reverence for Pinki Bibi as a true follower. Advance congratulations to Imran Khan on losing the 2018 Election. It was not best time to go for wedding. Imran Khan celebrates Lodhran Loss with third wedding. Eventually, the cat is out of the hat! Elections can only be won with undivided attention. Unfortunately that is not the case with Imran Khan. How many marriages going do khan? Who got married? Sadiq or Amin? Congrats Imran Khan, one more milestone left in your life. To become Prime minster Insha Allaha. nice pictures, wish him all the very best on new and fresh start ! Truth can't be hidden for long. Congratulations!! All the best wishes Khan Sahib! Three marriages in 20 years! Well wishes for the couple! Low profile event, yet headline ....wow khan Saab....personal life is the last thing true leaders care for. And he lectures around about nelson Mandela. So I spent last 1.5 month defending him for this? Hope this time it works out well !!! Many congratulations Khan Sahab !! In the spirit of decency and acceptance of one's free will, heartiest congratulations are on the order. Wow, such people who can not control their emotions and can not manage their personal outbursts, will control Pakistan's destiny. Although it is so difficult for me to believe that a western educated political personality would go for such a marriage nevertheless my heartiest congratulations to you Mr.Imran Khan and to your new wife. No issue with his 3rd marriages but Not very impressed of his choice. Congratulations. You are in a habit to make unpredictable statements. But I hope you now keep quiet about your private life. This is the only way for you to save your marriage. Just keep it private. The nation is happy for you. Have happy holidays. Congrats!! But where is Manika's ex-husband .. they should have invited him ..
Best wishes. I hope that she is sincere with you and your family. IF Imran Khan is elected a PM of Pakistan he would become another Yahya Khan. Wish the couple well to a happy life. Congrats,moving to extreme right r to get votes from from (sada -loh) awam?? A beginning of spiritual Pakistan. This man wants to rule our nation!Well in his dreams!!! Congratulations on your hat trick. Good luck Captain. What else is hidden in Imran's closet? Did he released photo with digital imprint of date to confirmed it happened yesterday? This lady is complete opposite. She may shun the publicity, which would be better for IK probably. Imran Khan's first marriage was with Jemima Goldsmith, daughter of a British billionaire. Khan's second marriage was to Reham Khan a sophisticated and educated modern woman..Imran Khan has now married Bushra Manika who observes purdah. Imran is going down, down, down? A major TV News Channel owes Imran Khan an apology . Congratulations ! May you have many more. ! 3rd Down ! Keep it up ! Now the cat is out of the bag ! IK is from England , where grannies and grand pas get married every now and then ! Finally! After all the news about Imran’s latest quest for “Personal Happiness” were true. It gives a very bad impression of Imran Khan, his party is in disarray in Punjab and the leader is getting married, I have a bad feeling about this. Hope I am wrong. Very nice Khan Sahib, one must have wife whether it is third or whatever ordinal number it is. It is Khan's personal matter or a matter of heart so there is no need of sisters as noticed by the reporter. They may thwart the chance of very spiritual marriage. WISH you a great life ahead #ImranKhan I hope this time, it would be a long lasting inning. Congratulations to Imran Khan from the core of my heart. I wish this brings happiness in the lives of the couple. Finally 'mubarak time' arrived to announce the wedding. Congratulations to the newly weds. Imran's political career is over. Thank you. If the marriage was confirmed than what is the point to keep it secret.. I don't know what to say to be honest. Speechless really. I hope Imran has married a mature woman appropriate to his age, and not some young school going kid! My apprehensions stem from the recent spate of gruesome happenings in our country! Congrats and wish you a very happy married life. I think Imran Niazi is self sufficient to destroy his own politics n party. Congratulations to him. We should not get involved in his private life. How many more dramas will be dramatized on the future stage no one knows. Well, what can you say. Best of luck but surely we were expecting an enlightened mind. I am your fan and diehard PTI supporter but you have disappointed me as you had promised the nation in May gatherings that ‘ you will never lie to the nation’. Here you lied to us in the beginning. If one can't manage even the marital life, one must not dream and live in fool's paradise to run the whole country which is already into the thick soup. Many congrats to Imran Khan and hope that he stays in this marriage for the rest of his life. He needs consistency and I hope that his marriage to Bushra Begun will bring this in his life. Congratulations to Imran Khan. Good news regarding his personal life though no doubt it will be turned into a controversy real soon. Good. I hope it works this time! Congratulations and good luck for this marriage. What's wrong with Imran Khan? Congratulations. Wish you both a happy and blessed married life. I hope this time it works for him. What a waste of precious space of the most respected English Daily of Pakistan. Great. From western looking to one in TRADITIONAL. Good going.. Congratulations.. Next.please. Congrulation IK . Why you hide your marriage or lying just one of your habit. I hope this time you keep sincerity to your wife. Have fun. Congratulations Imran Khan and, may you have peaceful marriage life together with lots of spiritual happiness! No doubt, there will be lots of speculations and jealous people around, who will try to take adverse advantage of this happy event. Congratulations Imran and Bushra Bibi. Wish you the best of luck for the future. congratulations to the couple ! Imran Khan says "I will like to reiterate that every time I met her, with family and alone, she has been in purdah." Are we to believe that Imran proposed to and has married Bushra Maneka sight unseen? Will the world at large never see her face even if she becomes the first lady of Pakistan? Is she a pretty lady? I guess we will never know, will we ? We'll be happy IK. At least may now you will start talking sensible --- politically. Could he not wait until after the elections? His focus should be on the failures of PTI in Lodhran.... not his marriage right now. PTI destined to lose again and IK will never be PM. Congratulations to PTI supporters. Now nobody can stop him from becoming PM of Pakistan. I hope he treats and respects her as a wife. Only Time will tell if this is a good union or not. Mashallah- wish all the best to the newlywed couple. Congratulations Khan SB, best of luck!! Congratulations, Wonderful. May almighty bless the marriage. Second marriage in a couple years. Does not seem like this guy is so stable. Mubarak Khan Sahib. Gob bless! Congratulations! Hope this marriage brings peace in his life. People should simply pray for the couple. No need to make links between Bushra's spirituality and IK's success in politics. Things don't work based on simple cause and effect rules. Also, marriage is not about spirituality, it is a material relationship. May the newlywed couple enjoy a peaceful life. May you have many more!!! We wish him well. He will need to have a wife when he becomes Prime Minister. Third time the charm, we hope, Mr. Khan! Congratulations. Live long and prosper - and multiply. With all due respect to Imran's personal life, he is my Dadu-Abu's age, he should better concentrate on improving Lives of Pakistani people across spectrum, rather than his own, Imran Uncle, please time to pay-back Pakistan. Best wishes Imran and Bushra ji! Thank you. Hope you get five-fer soon. Congratulations and best of luck to Imran Khan! Praying for the sucess of your tireless efforts to purge the country from corruption at the high level and turn a positive page in Pakistan's future. Congratulations. Best wishes for a happy married life to both of them. Congratulations, may the new couple prosper, Ameen. This is called Leading by example. Who is sitting next to Mr. Imran Khan. Congratulations. It is prayed that this marriage may bring life long joy, love and peace in the lives of the couple. lThe leader must be sensible enough to read the sentiments of the general public. Imran Khan totally failed to analyze the socio-political situation of the current scenario. He is unfit to be a leader. Nawaz Sharif is busy in electioneering campaign while Imran Khan is busy in marriagneering. All the best Khan - now please focus on the real job!!! Marriages are made in heaven and performed on planet, earth. Heartiest congratulations to both Imran and his wife. The nations's prayers and good wishes are with them on this auspicious, and very happy occasion. I'm not a PTI follower, but I do support people being happy. Congratulations Imran Khan and Ms. Bushra Maneka, may you find happiness in each other. Why announcing 7 weeks late? Something fishy as usual. Congratulations to both of them. I wish them happiness. Maybe many more will follow ttheir example of simplicity. All the best to the bride and groom and their families. Congratulations Imran Khan!! Wish you all the best. Please don't pay attention to people that are saying irrelevant things, such as, nikkah and marriage dates. Most important thing is you and your wife are happy. Third time may be a charm. Good luck to Imran Khan and his new bride. Good,May They Live Happily Ever After. IK Congrats for 3rd marriage n stay blessed & happy. 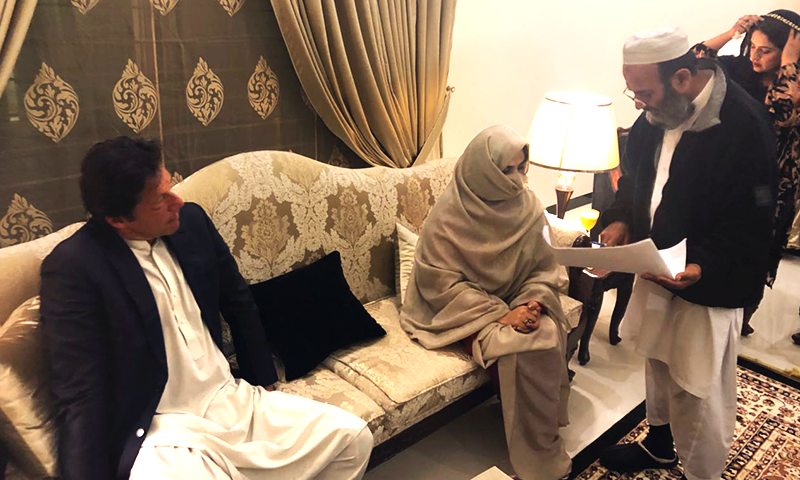 IK is 65 years old and the bride is 25 years younger than him. Why he can,t find some one of his age. Third marriage of Imran Khan, he still can marry one more time. What can you say? Perhaps no comment is the most appropriate comment at this early shock stage! Every one has right to live happily. Congratulations Khan Sahab. Congratulations to the couple. May they live a happy contended life. Congratulations and very best wishes from Canada. Wishing Imran Khan a happy and long married life. A well wisher from across the border. Blessing to the couple. May Almighty keep both the souls happy and give them ever lasting peace in their hearts. Would be prime minister of Pakistan ? Let's respect Mr Imran's personal decision. Hope the couple bring peace to each other and the nation. Congratulations to the couple. Let’s hope this marriage bring happiness not just in couples life but also in the country politics. She is a renowned mystic who is revered by thousands she is independently wealthy she will lead Mr Khan all the way to the primeministers chair, he went through many stones to find a diamond. Have a good prosper long lasted future Hope fully you are both lucky this time. Living single life is not easy in every aspect. I am in the same boat and its not easy as am getting older. Once again A very happy married life to Imran Khan Saheb. May the mutual love, respect, and understandingalways prevail in their life. Aa'meen. Try try once again till u succeed..Best wishes & hope u find peace & happiness. First PTI declared IK's marriage a personal affair of him. Now, PTI is announcing the same. Why no family members of IK invited in all of his three marriages?? How can a restless soul govern even a town council. Congratulations Imran Saheb! Wish you find solace in your third attempt of being a family man! I wish to congratulate Imran Khan on his marriage with Madame Bushra Maneka. I pray that this marriage is demonstrated in successful married life and mutual respect.On the political front, I would expect from him that he moves away from TUQ, Sheikh Rasheed and their fellow travellers. Now everything will be healed. Enjoy captain! Doing marriage 3rd time or 4th time is not a sin, but there is a great need to make the marital life long lasting. I pray for the couple to have continued prosperity and happiness. Congratulations for starting another life! Stay Blessed. Wish u happy and wish it to be your last marriage. Personally Imran Khan knows better about his decision but politically a bad timing. Wish him happy married life. No room for denial now, so why people are not wishing them well here. Let's stay above party politics. All the best and congrat. to Imran khan.. Now take care of Party. Congratulations khan Sb plz lead the country as well please. A man who cannot keep a woman under control, expects to control two hundred million people. wow. Wishing him better luck third time. His children from his first wife were quite excited to attend their dad's third wedding. Why he needed to get married at this stage? Good solution of getting spirituality. AlhamdulilAllah , all the best for them and for everyone who is trying to do right . Best Wishes. If you can't do good for Pakistan at least do good for your family. Have many children, set a record. Congratulations and good luck, hope it is your last venture! Congrats Mr. Imran. Best wishes for you. very beautiful wife. Mashaallah ! Who needs soap opera, just read daily news papers. The best thing is not comment and just wait for 2 - 3 months and then suddenly PTI workers will start labeling her a foreign agent and compromised. Something he could have avoided. 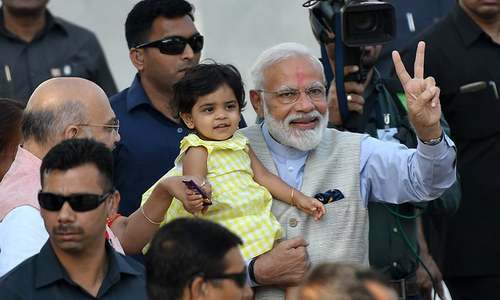 Normally at this age, the person is supposed to retire from regular family life and focuses on Din..
One guy who doesn't learn for his failures or you can say one guy who keeps on trying till he succeeds. "He expressed hope that Imran Khan's marriage would prove blessed not only for him and his wife but for the entire nation." Yes indeed, no other family is broken for his fantasies. @Javed how both(marriage & losing 2018 elections) are correlated? will you elaborate please. Now IK needs to get busy on focusing his energies on the goal! @Nayysr the fact you can't be happy for someone getting married speaks volumes about how much you envy them. Full stop. I send my congratulations to Imran Khan for getting married and may this ceremony provide him good luck and happiness that he desires. But, I suspect his opponents will criticize him as usual and make adverse comments! Imran there are a lot of hopes from you... It's your modesty and simplicity that is charismatic... You have been true to the country... We know you are not a politician so you will make mistakes but pls pls don't let the arrogance and highs of power and popularity intoxicate you.... The poor and weak need to know there is hope.. I appreciate all the comments congratulating Imran Khan and feel sorry for the people commenting negatively on someone's wedding. Long live the beautiful pair. @YOGI .. cannot control emotions... chief, there is more to marriage than emotional gratification!! You must grow up and think mature!! What is the correct date - Jan. 1 or Feb. 18? The voters need to know. That could be said of every profession. I presume you are not married and you should never get married. If you are you shouldn't be as you are not as focussed on your job as you should be. Good luck but very disappointed how this has been conducted, a leader needs to show more maturity than this and conduct himself and his affairs much better than this. Lets hope, you don't end up mixing your private life with politics again. Focus on the election ! I wonder how a person who wants to lead the country has to go to a PIR for advice..
@sukhera: What is the fun, then? It’s a personal matter and no one has any right to interfere and/or interpret in others personal life. No matter if the person is a public figure, everyone must respect others privacy. Not sure what to make of this, hope it works out. @Javed Election-Welection. Imran doesn't care. He has Busra now. He is happy. For the time being any ways. @Javed He realized he wasn't going to win the election any ways. So, why not enjoy the married Bliss. @Abid nawaz khan are you serious? Would you like to be invited to your ex wifes wedding. @saeeds what did he lie about? He told us after he sent proposal for marriage. He told us after he got married. @Fatima. Poor comment. Hope you don't take your own advice. @Dr MD. Focus on the election? People will probably vote for the same old. Afford him some happiness. @Fatima Khan. I think the soap opera is in your head. No one ever said that. @brr - Yea, because getting married is only what kids do, right? If you are going to comment on someone’s behavior, at least make your own comment a little less immature. Thanks. What a emotionally unstable leader!!! Trust me, he needs urgent medial attention. Congrats from IK’s biggest fan from The Great Country of republic of China. We the People of China wish to see you be more successful in marriage and serving the great People of Pakistan. Come to China for Honeymoon. IK has set the bar too high for Pakistani men. Congrats though! Imran Khan got married to a faith healer. Really? Everybody needs spritual guidance at this age,looks like Imran Khan needed more. He has kept his third marriage secret successfully for about 2 months from the people he wants to server( read Rule). Isn't it a hypocrisy? @Ali Well when you are in public life, there are really no personal issue, as your life' major part belongs to people. I cannot think of any issues that should remain confidential from people who submit themselves to the leaders at all levels. Marriage is the right of everyone, plz don't make it controversial. How many times will you get married. Marriage is a very personal choice. Mr. Khan, hopefully this time, its a brighter one for you! Cheers. IK is my leader. If he wanted, he could have marry to much younger girls, but he proved that he is marrying for companionship. No men in Pakistan will marry a women with Five Childern. we can pray for khan.